More to come, including turbo swap info... I worked on the site for almost 3 hrs today but I've got other stuff to do! If you have suggestions on stuff to be included or have a writeup of your own, please pm it to me, and I will add it in. I'm keeping this sticky locked so it stays uncluttered and easy to read. After doing lots of research on pump modifications and parts available, I thought I would post up the results of many hours of reading and a few phone calls. The stock pump on the D24T is actually bigger and has more fuel flow potential than its smaller cousin, the 1.6 TD. Even though the engine is pretty much the same with two more cylinders, for whatever reason VW engineers decided to fit a larger head and rotor for the D24T. Stock in the VW 1.6 pump is 9mm. The D24T is a 10mm head. Bosch VE pumps are found on many different diesel engines from our VWs to Cummins diesels. There are however two main varieties, the 17mm shaft and 20mm shaft. The 17mm was used for smaller pumps with 9mm and smaller heads, while the 20mm was used for 10mm and larger. While you can swap a larger head onto a 17mm shaft pump, the ideal situation would be to have the 20mm version. Even though most pumps have the 20mm shaft with the larger heads, our pump is the 17mm shaft version. Most likely because our cars are from the early 80s. 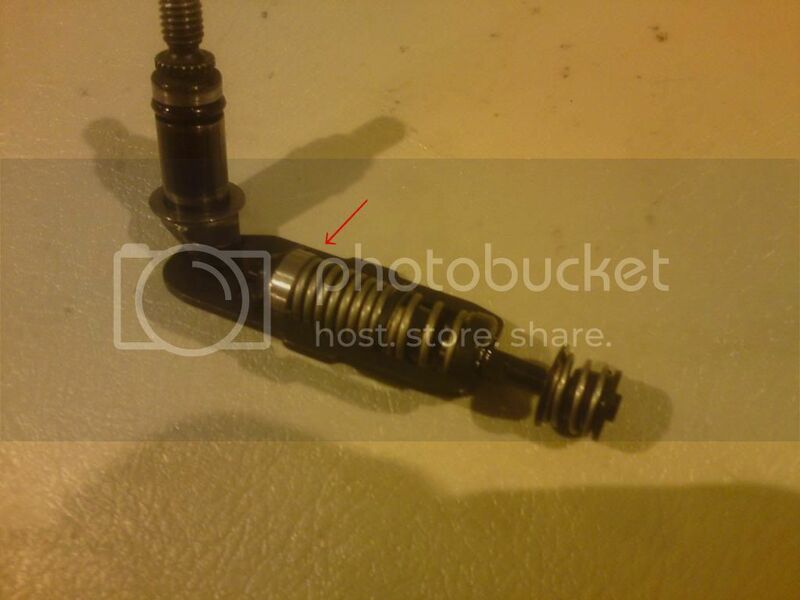 I think the 10mm head being on the 20mm shaft logic was applied later, as thats how the TDI pumps are. The 10mm head is only going to flow so much fuel, (supposed to be able to support around 200hp) so stepping up to a 11 or 12mm head opens the door for some real performance. After buying a Cummins 12mm head/rotor assembly, and trying to assemble the pump (which wouldn't go together correctly, I had that "you are a dumbass moment". Unfortunately for us, the Cummins engine has the injection pump driven off the front of the engine. Where is the D24 pump?? On the back of the engine... What does that mean to us? Our pumps are LEFT HAND ROTATION!!! Right hand rotation head/rotor/cam plates wont run our engine. I even called Giles, the renouned hotrod VE pump builder in Canada. I'm still trying to find the part number for the left hand rotation 12mm head/rotor and corresponding cam disk. Another source is vepump.com. This is a manufacturer of many diesel injection components from individual pump parts, to complete pumps, injectors, etc.. They are in China, and that I'm sure throws up a red flag for many people (as far as quality is concerned). Even so, I have personally talked to a few members through the forum in Europe that are running their head and rotor assemblies along with other misc pump parts and have had great luck. Everone I talked to also commented that the parts looked/felt/fit like OE. At this point, a lift pump to the injection pump is going to be a good idea. The Cummins engine with 12mm head came with a low pressure lift pump to supply fuel to the injection pump. The stock vein pump will be much closer to its limit supplying a 12mm H&R compaired to the stock 10. A lift pump supplying around 8 to 10 psi will ensure that the pump is never starved for fuel. At 5000rpm and full fuel delivery, the vein pump will be having a hard time sucking enough fuel to keep the pump at full pressure, and performance is likely to suffer. More than 15lbs of pressure has been known to blow the front shaft seal on the pump. A low pressure high volume pump is ideal. A popular choice is a Holley red pump. They come pre set at 7 or 8psi and can handle diesel fuel. This modification will alow the pump to provide full fueling to redline (and actually alow the engine to rev higher if you want.) Really the stock redline at 5k rpms is quite high, but on the way up there the governer starts to kick and and defuel the engine. By the time you are at 5K rpms, the governer will have defueled the egine noticably. By doing this mod, you will have a new level of top end power as the engine will pull HARD to redline. Remove the top of the pump. If you don't know how to disassemble the pump to this level, you probably shouldn't be attempting this modification!cover of the pump. The govnerner is the assembly that attaches the throttle shaft to the pump itself (it actuates the fuel rack). The spring assembly has three parts a very soft idle spring, an intermidiate spring and a long main sping. Leave the softest spring as-is (this is the low speed spring). These springs are set up progressively. Once the idle spring has been compressed the intermidate spring is next and once that has been taken car of it starts on the main spring. The intermediate spring is what we will be working with. When you take apart the governer, remove it from the pump and bring it to your bench or a clean work area. Pay VERY CLOSE ATTENTION to how it is assembled, such as the order that washers/springs are stacked. If you reassemble it incorrectly you could loose governer controll and possibly have the engine run away, or it could fall apart and ruin the pump! This is a make or break assembly in the pump when it comes to how the engine runs, so pay attention! 1. Replace the intermidate and main sping with a solid piced of tube or strong wire ect... somthing that doesnt compress. 2. Shim the intermidate spring placing it in coil bind and preloading the main spring slightly. You can use pop rivot washers or something of that sort. Reassemble and go for a test drive. You should notice a huge difference in midrange to top end power!